Petite Outfit: For My New "East Coaster"
A very good friend and co-worker of mine is heading to medical school this fall in Vermont (Brrrr!!!) so her sisters held a “Medical School Shower” for her over the weekend. In honor of her imminent New England naturalization, I wanted to wear something a little…um…east coasty. When I think New England, I think preppy (Cape Cod! Nantucket! Yachts!). My favorite preppy item is my LOFT striped button down which I got tailored to fit, so that part was easy. Then my eyes fell on my newly un-earthed from the bottom of a drawer Theory sweater vest, and a match was made! Why hello there outfit…where have you been all my life? Tip: I love when items look tiny and cropped on models. It gives me a clue that the item might fit me normally. In this case, it worked! Check out how the Theory sweater vest I’m wearing fits on the model (here). Sweaters can also be shrunk to fit petites better. See shrinking advice (here). I threw on my favorite pearls (I just can’t not wear them) and my rubies (my birthstone!). Just to make sure I looked extra ridiculous stylish, I added some tweed Manolo Blahniks to finish off the look. Oh yeah, and my red Rebecca Minkoff Mini Mini (red Chanel would have made an appearance, but the shower was at a bar, and spilled beer + Chanel does not mix). 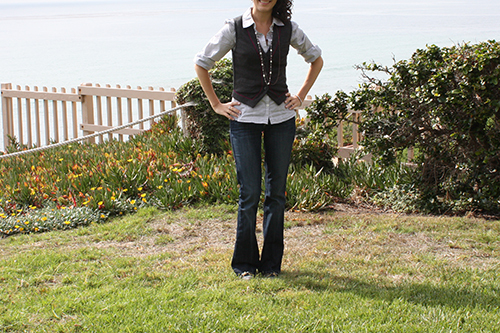 I liked this outfit so much, I ended up wearing it again to go see the musical Avenue Q at the San Diego Civic Theater. This show is amazingly funny and I highly recommend it to anyone with a sense of humor. The musical is basically Sesame Street for adults, so get ready for a raunchy good time…with puppets! After the show…at the beach house! Lol, don't you love it when you fall over due to heels sinking into dirt? Biggest mistake ever was me going to a backyard wedding in stilettos. I am envious you have a spacious picturesque-yard to photograph in. I have to brave the streets of Boston and wield stares from neighbors. Everyone equates east coast style with preppy and tweed – is that true? Lol! I don't have any signs of prepster in my closet…I don't fit in. PAG – LOL. I'm sure you left their backyard thoroughly aerated. I hope east coast style is preppy. Otherwise, all my dreams of wearing seersucker in the Hamptons are bashed! J/k. I see you as a cosmopolitan east coaster, which is a way harder look for me to achieve. Here in LA all we know how to do is hipster. Bleh. I think the East Coast preppy stereotype stems from the ongoing representation in film and other media of upscale north eastern private schools (both secondary and colleges) which feature either a mandatory uniform, or a style of dress steeped in traditional attire. I think when most people think 'boarding school', they picture some bucolic brick building-covered in ivy campus with young people dressed in lots of tweed, plaid, wool, and dark neutral colors and pastel oxford shirts. The same goes for the concept of Ivy League schools and other private old institutions. The reality is we dress as widely and varied as anyone else, although we are highly affected by the weather. Medical school at UVM means lots of fleece, wool, and Gore-tex…winters in Burlington are brutal if you are not into things like cold, darkness, and lots of snow. I love your outfit – I would totally wear that, and I would definitely categorize it as preppy – and I think we all equate 'preppy' with New England, since the whole preppy style sort of evolved out of traditional private school uniforms and dress. Gore-tex – I had to look that one up. Kerry/littlenashua – LOL, "bucolic" … haven't heard that word since the SAT's. I agree with your comment though. AN – seersucker is all the south. That stereotype is 100% true. I worked with some Alabama folk when I lived in north carolina, and they wore seersucker almost daily. 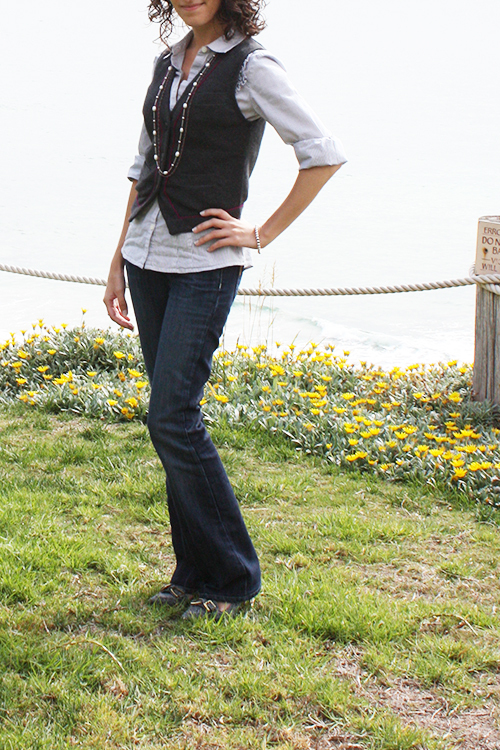 Btw, it's funny you and Jen both mention hipster style with slight disdain…I LOVE dressing hipster! I feel it really works with our lean body types. I never post pics of me in the fall/winter casually because I'm in super skinny jeans/leggings, vans or keds sneaks, with oversized tops and scarves. I don't think that look is appreciated by the women in our blogging niche, so I've made sure to leave it out. Btw, are you planning on using the 40% off TWO items coupon BR sent out today? "Biggest mistake ever was me going to a backyard wedding in stilettos." AN…the vest looks better on you than on the model. I often find these tall models look silly modeling sweaters, etc. They look like they're wearing children's clothes. The J Crew website is a good example of this. 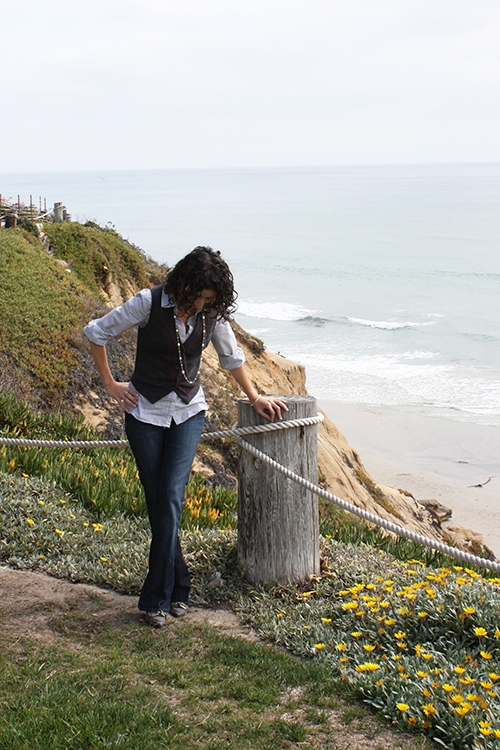 Love your outfit…and the view! Heels and grass are not a good mix. The lady at the bridal salon where I got my dress suggested that I get wedges for the ceremony because my heels would sink in the grass and/or I'll fall. PAG – I've seen so many hipster girl's bare behinds because they don't realize that leggings are not pants, and actually stretch to become see-through, that I'm forever traumatized. I avoid the hipster look like the plague! Lol. Nope, I'm not going to use the BR 40% off coupon today. I posted mine in the AN Forum if anyone is interested. HM63 – I just found another ridiculous looking model today wearing a teeny tiny dress in the Neiman Marcus Last Call sale. I posted it on Twitter. She certainly looks like she's wearing children's clothing…lol. What pretty photos!!! Your outfit is so cute!! Gorgeous view! I love how these photos make you look tall, you would never be able to tell you are 4'11! Very nice vest. It looks great on you. When I checked out the model picture, I laughed really hard. It looks so ridiculous. I guess it is good for petites that clothes are more and more shrunken now. I had such fun reading through all the comments. I moved from CA to MA 7 years ago and before the move, I had the same impression as you all do – New Englanders dress UP. After I moved here, I found out that it's not the case. I agree with what PAG said in her comments. PAG: I would love to see you in your hipster outfits. Sounds like a lot of fun. Do show!!! I'm such a fan of your blog and I feel like I would recognize you if I saw you on the streets on San diego (where I live). But I'd only stare and just wonder from afar since I don't actually know what you look like. But I'd recognize the clothes! and that Minkoff bag! I didn't know Ave Q is @ the civic theater right now. I will have to look into getting tickets. It gets good ratings! You look great w/your vest. The red trimming is a great detail. How fun! When I think EC, I think polos & khakis. Not entirely true in real life, but that's just the stereotype. Aubrey – I think Avenue Q has left SD already. It was only at the Civic Theater for less than a week! Bummer! I think it's coming to LA in March 2011 if you're willing to make the drive. What a big difference perfect fit makes, you tall and adorable!